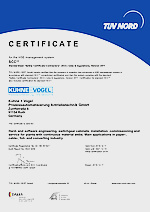 Kuehne + Vogel has been certified by TÜV Nord in accordance with the "Safety Certificate Contractors" (SCC) 2011 version. The certificate is valid for hardware and software engineering, switchgear construction, assembly, commissioning and service on systems with continuous webs with emphasis on paper, cable, foil and converting industry. Roth, 19.11. 2018 – Incorporation of Kühne+Vogel Prozessautomatisierung Antriebstechnik GmbH into VINCI Energies Deutschland GmbH. “The incorporation of Kühne+Vogel Prozessautomatisierung Antriebstechnik GmbH into VINCI Energies is an important step to enable us to meet current and future challenges in the growth markets in the automation and drive technology sectors. The group philosophy of individual corporate responsibility within VINCI Energies enables us to act as a competent and agile medium-sized company. Integration into a highly innovative international technology group will also ensure a stable and future-proof framework to manage the sharp increase in our sales and project dimensions and the further development of our company”, says Reinhold Kühne, CEO of Kühne+Vogel Prozessautomatisierung Antriebstechnik GmbH. 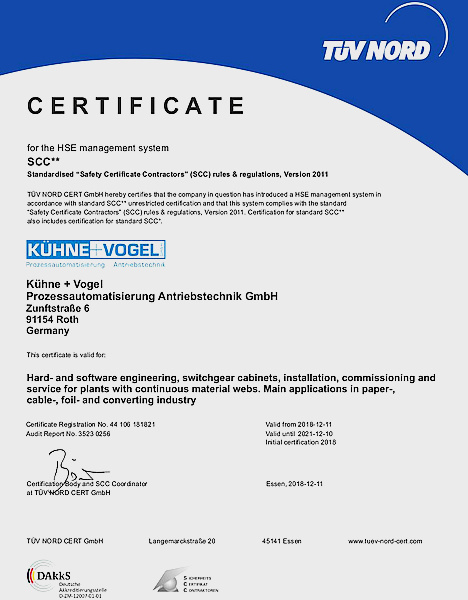 “Kühne+Vogel is a leading provider of innovative solutions for automation and drive technology with an impressive wealth of concepts and expertise, and is a certified solution partner for Siemens in automation and drive technology. For Actemium, the incorporation of the company into the VINCI Energies brand offers new growth potential across multiple and highly specialised industries”, says Frank Westphal, CEO of VINCI Energies Deutschland and CEO of Actemium Deutschland.